NISC journals are divided into two categories. Journals which only publish articles Open Access. These journals are identified on our site by the Fully Open Access logo. Traditional subscription journals, which offer authors various Open Access options. 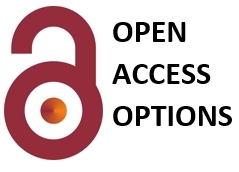 These journals are identified on our site by the Open Access Options logo. Further details about these two types of publishing options are detailed below. NISC publishes several titles in which one can only publish articles Open Access. Some of these titles may charge publishing authors an Article Processing Fee, while others are able to rely on institutional funding and/or advertising revenue and therefore do not need to charge author fees. For clarification on charges please link to the relevant journal's Author Information page from the list below where any relevant charges will be fully detailed. All authors publishing in a NISC subscription-based journal are able to upload certain versions of their article online to their personal website or institutional repository without even publishing their article Open Access. This is traditionally referred to as Green Open Access. For full details on the versions that may be uploaded as well as the relevant embargo period for each article please click on the link. An article published in any NISC subscription-based journal can also be published completely Open Access by paying an Article Processing Fee. This is traditionally referred to as Gold Open Access. In a NISC journal the author may only elect to publish via this method once the article has passed peer review. Please click on the link to see our full gold Open Access procedure and relevant pricing. Open Access is a movement triggered by the advent of online publishing. Traditionally academic research was only available via the use of print materials and most of this was only available via procurement. The Open Access movement aims to make information more readily accessible by making it available to use free online. This free availability of research has also prompted a re-evaluation of the terms under which research is published, used and reused. Various publishing organisations, both traditional and new, have developed new Open Access models to meet the growing demand. The era of online publishing and the associated Open Access movement have brought about a period of unprecedented change and innovation in the academic publishing industry. Although a traditional subscription-based publisher, NISC was an early adopter of Open Access initiatives. In 2005 NISC hosted and supported the new African office of African Journals OnLine (AJOL), which had moved from Europe. AJOL is a not-for-profit platform that aims to increase access to African research through various innovative Open Access initiatives. AJOL grew exponentially during its collaboration with NISC and is now fully independent. In 2007 NISC made Open Access publishing options available in all its journals, ahead of many larger subscription based publishers. Many NISC journals have been available through INASP and various Research4Life programs since 2009. In 2010 NISC started publishing its first fully Open Access title the Indo-Pacific Journal of Phenomenology. Today NISC is a publisher of both hybrid and full Open Access titles. We are have various Open Access options available to suit the needs of our authors and publishing partners and have are committed to remaining flexible in the ever changing Open Access environment.